Solar power continues to grow by over 30 percent annually. Solar panels cost 100 times less than in the 1970s. Solar is clean, often generated at or near where electricity is needed, and not at the mercy of fluctuating coal or uranium prices. The timing for solar energy growth is excellent. Voters have lost their appetite for spending billions to try to make coal clean while carrying the burdens of health damage. Similarly, most voters do not want to pour billions into loan guarantees for expensive nuclear power in the wake of the disaster in Japan. Ten solar manufacturers in China produce over one gigawatt of solar panels. High manufacturing volumes, lower labor costs, and favorable government policy have helped lower costs. Morningstar estimates that China has a 20 to 30 percent manufacturing cost advantage and that Trina is producing crystalline silicon cells for 78 cents per watt. China may be winning the c-Si cost battle, but First Solar uses thin-film innovation to lower cost. First Solar is increasing manufacturing capacity from 1.5 to 2.3GW per year, including manufacturing in low cost countries such as Vietnam. Last year it improved its CdTe module efficiency from 11.1 to 11.6 percent to deliver 75 cents per watt cost. GE announced 12.8 percent efficiency with its CdTe panels. In 2013 it will have a new 400 MW plant online. Honda is betting on CIGS thin film. Venture capitalists are betting on exciting emerging companies as the efficiency and cost battle intensifies. Dr. Alex Levran, President of the RE Division of Power-One, asked the industry to measure system efficiency in harvesting energy, rather than just evaluate inverters efficiency with specific solar modules. He identified areas for cost savings including eliminating the grounding of inverters. This is not done in Europe and it lowers inverter efficiency. Europe uses 1,500-volt systems. In the U.S., 600 volts is common. Modular inverters are need for quick repair. He feels that a 10-cent/watt goal is feasible in 2 to 3 years with the right component costs. Experienced conference participants agreed that a major variability in annual electricity generated from a solar project is how well it is installed. Square feet can be used optimally or poorly. The slope of panels needs to be ideal. The quality of wire and installation affect longevity and output. SolarTech is working with industry groups and community colleges to insure a growing pool of skilled labor. My wife and I recently rode our bicycles to a 5 MW solar installation in the middle of San Francisco. The panels are mounted at ground level on the cement cover of a local water reservoir. Labor and construction costs are lower on the ground than on old roofs that may need to be upgraded to support the weight and maintenance of solar. Near ground, such as erecting steel grids to cover parking structures, can also be more cost effective than roof-mounted systems. A public utility can make it easy, difficult, or impossible to connect to their system. Follow the money. Some solar makes them money; some costs them. Some projects provide RPS credit; some do not. I once shared lunch with a public transit manager who wanted to cover a transit line with megawatts of solar power and a water wholesaler who wanted to buy the power. It was a win-win and the numbers worked, except that they were legally required to put the local public utility in the middle. The utility wanted to build a new natural gas power plant. Somehow, the solar numbers no longer worked. Laws need to be changed, so that micro grids and markets can work without utility monopoly power. 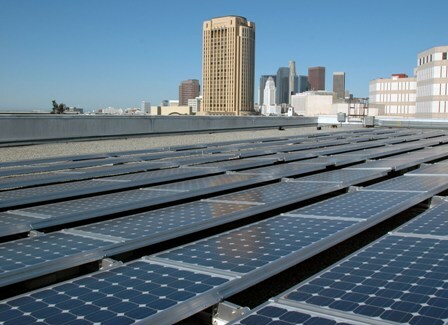 Installation of solar power is complicated by having 21,500 local codes to deal with beyond the National Electric Code. Permitting can take weeks. Inspection outcomes and reworks are variable costs due to lack of one national code. Promising is DOE’s Solar America Board of Codes and Standards (Solar ABCs). Solar financing needs to be as easy as getting a mortgage loan. Instead, many solar projects fail to get financed. Lenders need more certainty in the annual output expected from projects for 20 years. Standard spreadsheets and models would help. More certainty about government policy or an established carbon market would greatly help. Major players that could aggregate many projects would add diversity, certainty and simplify rating and securitizing large portfolios. In Europe, feed-in tarrifs have greatly simplified financing. Concentrated photovoltaics, in the lab, have demonstrated 41 percent efficiency; roughly double the c-Si being installed. Now what is needed is low cost manufacturing of CPV, 20-plus year reliability, and effectiveness over a range of light-source angles. Also, in the pipeline are gigawatts of concentrating solar-thermal utility scale plants. The big challenge for these plants is years of site approval and high-voltage lines to load centers. Mark Platshon, Vantage Point Venture Partners is optimistic that installed solar will reach $2 per watt. The magic dollar per watt would require PV to be reduced to 30 cents per watt. Hybrid systems could lower the total cost taking advantage of common infrastructure and interconnect with hybrid systems such as solar and natural gas, roof PV and BIPV, and solar on existing light and power poles. Victor Abate, GE’s VP of Renewable Energy Business, stated the GE has sold 60 megawatts of its thin-film solar to NextEra, an existing GE wind customer. Abate said, “We are an energy company and expect to supply full solutions.” He suggested that if ten percent of GE’s wind farms added hybrid solar, the new 400MW GE factory would be sold out for six years. Solar power often delivers when electricity is most needed, such as hot summer days when air conditioning is blasting. Storage of off-peak solar for peak use would add to solar energy’s value. One approach is concentrating solar thermal with molten salt storage. For PV, utilities are piloting a variety of promising grid storage, some as large as 150MW using compressed air, advanced batteries, and even flywheels. In the next decade, major storage could come from electric vehicle to grid. Ralph, thanks for the excellent ideas about added ways that solar cost could be lowered and made affordable for all. Manufacturing scale could also be based on using solar assisted factories to build components. Use the mass production techniques employed bt the auto industry. America can build the units at a cost near the Chinese by utilizing the “free” power of the sun. Installation costs could be lowered dramatically in at least 2 more ways. #1 –use the multimedia abilities of (“virtual learning”) the internet to teach any interested trade person how to install the units properly across the United States. Having more qualified personnel, will lower the cost of installation because of the competitive factor. Using the same virtual medium for safety training is essential. Our education system is adopting this method of learning to cut costs and broaden the learning base. This new technology needs to do likewise. The right size should includemainly residential rooftops for maximum efficiency (lower voltage drop and transmission cost). The electric car charging savings will also save each consumer money for years to come. Laws need to be passed to force the utilities to allow feed in. They want to preserve their present monopoly and will purchase and persuade politicians to make it difficult for consumers to benefit. Codes should be simplified. Each community needs to put an on-line diagrammatic explanation showing how they have simplified the local process. Permit fees should be completely waived. Permit approval should be fast tracked. Financing. Leasing solar should have a limit on profit (and a time limit). There is no reason to pay a bank for the lifetime of the solar unit –just because they have bled our financial system dry. They should not be allowed to reap exorbitant profits from this technology via “creative financing” -free solar?. If anything they should offer extremely low (or no) interest loans so that the benefits to our overall economy occur more rapidly. Similar to what is being offered to get rid of the existing gas guzzler market. Home and small business tax appraisals/assessments should be frozen for a 5 year period to assist the return on investment. Programs to assist low income and disabled individuals need to be implemented in every community to assist in solar rooftops as they are now doing on the east and west coasts. These programs need to be expanded, as our senior citizens could also use the benefit of the free energy from the sun to alleviate their expenses. A substantial amount of jobs will be created for the installation and maintainence of rooftop solar. Many more than utility scale projects. The more jobs created, the more our economy grows, lower solar cost will result. Other countries will adopt this model (many have already done so) if we choose not to.